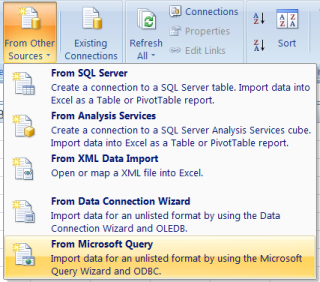 Query parameters are a very useful Excel feature allowing parametrization of database queries used to import data in Excel. They are really simple to use as well. On the Definition tab of the Connection Properties dialog there is a Parameters... button at the bottom. It gets enabled as soon as there is a parameter defined in the Command text – you define it by typing in a question mark (?) instead of a value in the WHERE clause of the query, as seen in the image below. Since the error doesn't even hint at the real cause of the problem it took me some time before I figured it out. 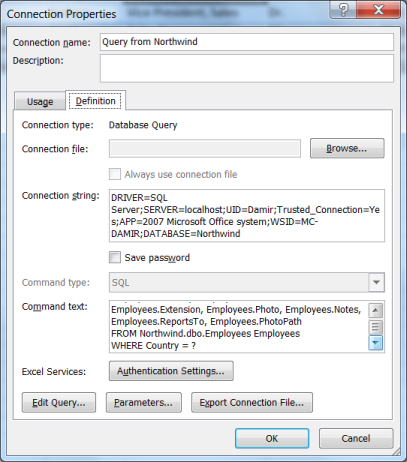 The thing to remember is: if you want to use query parameters, you must select Microsoft Query as the external data source when importing the data for the first time. This can't be changed at a later time.